To be a Futurist in the Italy of the early 20th century was to be modern, young, and insurgent. Inspired by the markers of modernity—the industrial city, machines, speed, and flight—Futurism’s adherents exalted the new and the disruptive. They sought to revitalize what they determined to be a static, decaying culture and an impotent nation that looked to the past for its identity. 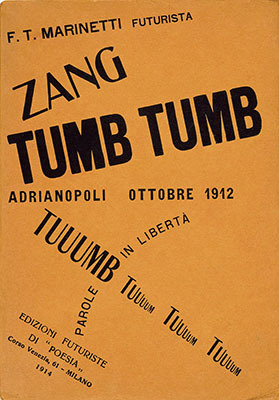 Futurism began as a literary avant-garde, and the printed word was vital for this group. Manifestos, words-in-freedom poems, novels, and journals were intrinsic to the dissemination of their ideas. 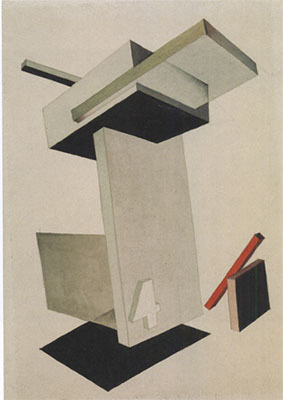 But the Futurists quickly embraced the visual and performing arts, politics, and even advertising. 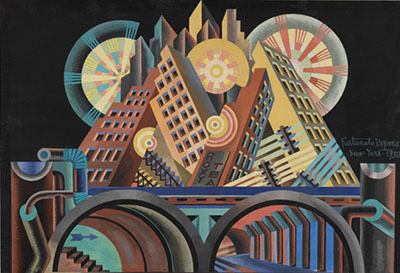 Futurist artists experimented with the fragmentation of form, the collapsing of time and space, the depiction of dynamic motion, and dizzying perspectives. Their style evolved from fractured elements in the 1910s to a mechanical language in the ’20s, and then to aerial imagery in the ’30s. No vanguard exists in a void—all are touched by their historical context. 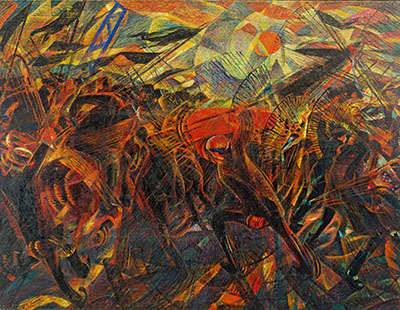 The Futurists’ celebration of war as a means to remake Italy and their support of Italy’s entrance into World War I also constitute part of the movement’s narrative, as does the later, complicated relationship between Futurism and Italian fascism. 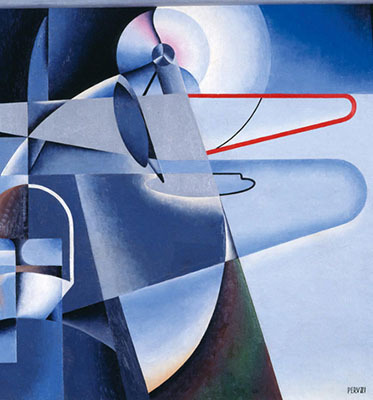 This exhibition endeavors to convey the spirit of Italian Futurism in all of its complexity. The Guggenheim Museum’s architecture lends itself to the display of this multidisciplinary idiom. Taking its cue from the Futurists’ concept of the “total work of art” (an ensemble that surrounds the viewer in a completely Futurist environment) and their aim to achieve a “reconstruction of the universe,” the presentation integrates works in multiple mediums on all levels of the rotunda. Objects are organized in a roughly chronological order, with filmic components bringing to life some of the movement’s more ephemeral activities, such as performance and declamation. 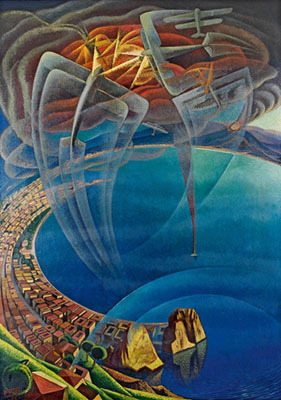 The Futurists were insurrectionary and stridently vocal, and thus Italian Futurism welcomes a certain amount of visual and aural cacophony. 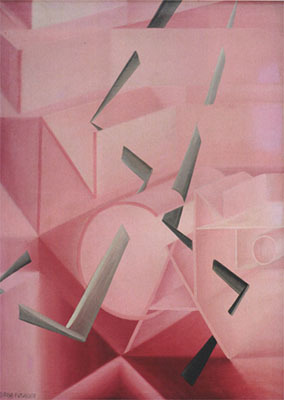 Futurism was punctuated by paradoxes: while predominantly antifeminine, it had active female participants; while calling for a breakdown between “high” and “low” culture, it valued painting above other forms of expression; while glorifying the machine, it shied away from the mechanized medium of film. 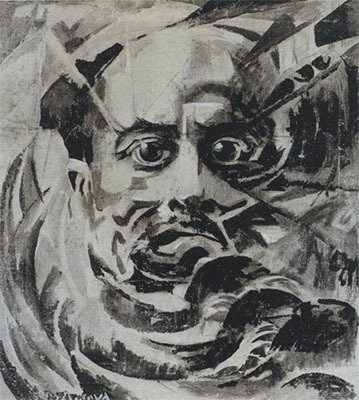 By 1929, the artists who had denounced traditional institutions saw their leader, Marinetti, become a member of the Academy of Italy. And many of the revolutionary Futurists complied in some way with the Fascist regime. 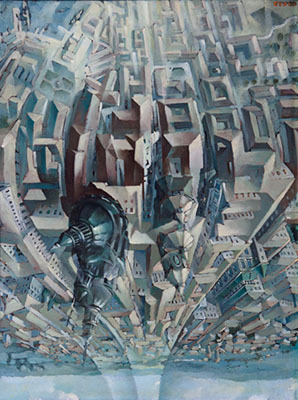 Through a comprehensive examination of Italian Futurism’s full history, the exhibition offers an opportunity to reassess one of the most contentious of modernist movements. 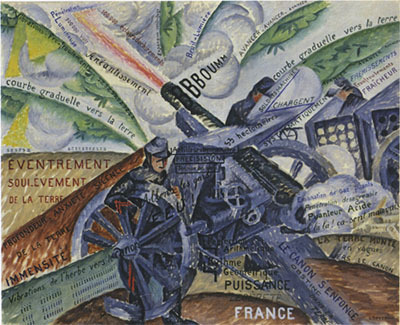 The years leading up to World War I are often called Futurism’s “heroic” phase. 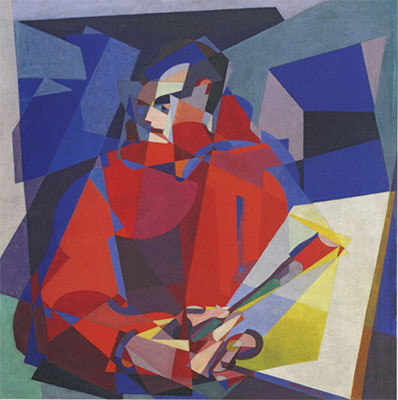 In this era colored by optimism, the Futurists worked in a mature avant-garde language; their compositions edged toward abstraction and they reinvented traditional artistic forms. The group also acquired members beyond the initial Milan–Rome axis. 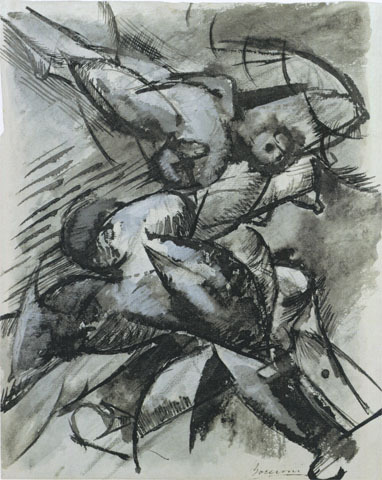 In Florence, for example, Giovanni Papini and Ardengo Soffici became involved with the movement. 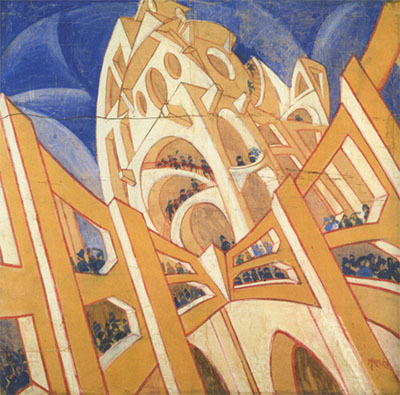 Their journal Lacerba (1913–15) published history-making exchanges on Futurism. 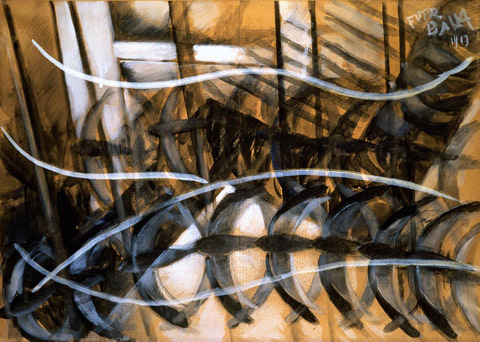 Futurist visual artists agreed that the representation of dynamism and simultaneity was tantamount, but were divided on how to achieve this. 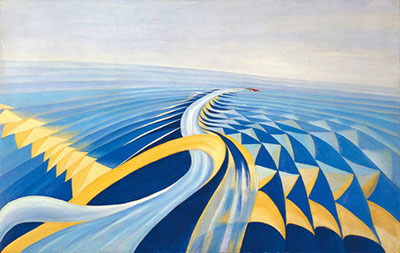 Giacomo Balla examined trajectories of movement. 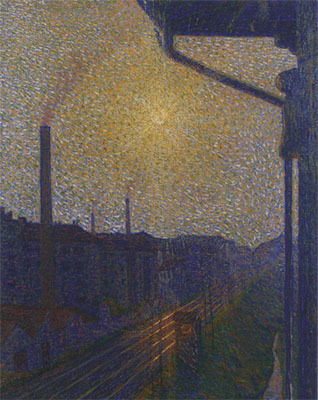 The Iridescent interpenetrations, which are thought to illustrate light’s movement in electromagnetic waves, are his attempt to portray the universal dynamics that permit speed. These explorations informed his later Abstractions of Speed, a series prompted by the reflections of passing cars in shopwindows. 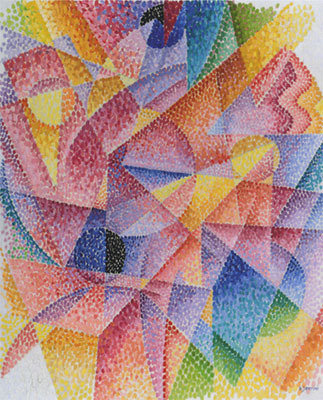 Balla realized his own visual vocabulary for velocity by combining the Futurist principles of dynamism and simultaneity with allusions to light, sound, and smell. 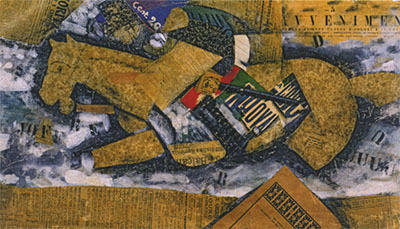 On the other hand, Umberto Boccioni and Gino Severini sought to represent the distorting effects of motion on a subject. 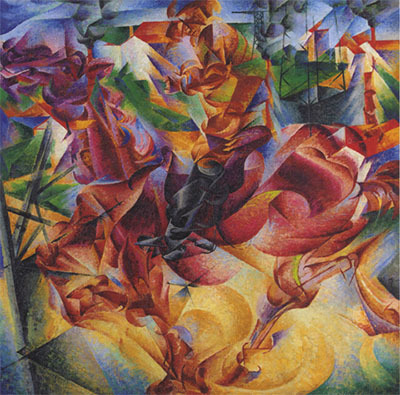 Boccioni looked to the action of the athletic body, merging figure and ground in his activated renderings of a rider on a galloping horse and of a cyclist racing through a landscape. 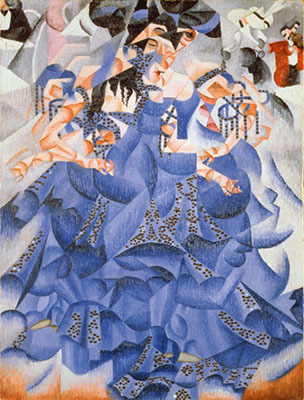 Severini’s exposure to Parisian cafes, cabarets, and dance halls compelled him to study movement through dance, painting fragmented, whirling forms. Revolutionary literary and architectural experiments also occurred in these years. 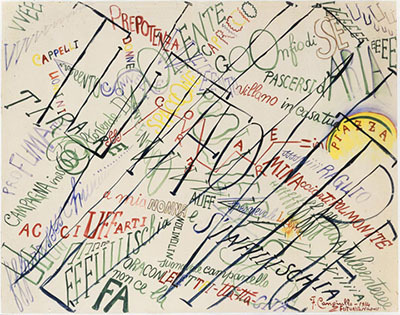 The Futurists pioneered a style of visual poetry they called parole in libertÃ , or “words-in-freedom.” Introduced by F. T. Marinetti, words-in-freedom was seized upon in the 1910s by Futurist painters and writers who produced confrontational, unorthodox sketches (tavole parolibere) on modern themes. 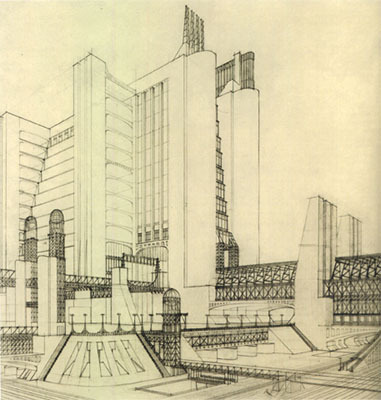 In 1914 the architects Mario Chiattone and Antonio Sant’Elia each created a series of utopian (and unrealized) designs for the contemporary city. Incorporating new materials and accommodating rapid transport, they reenvisioned urban existence through a vanguard aesthetic based on technology. 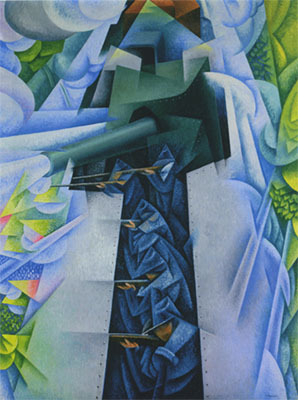 Following World War I, Futurism gained new members and assumed different formal qualities, including those of arte meccanica (machine aesthetics). 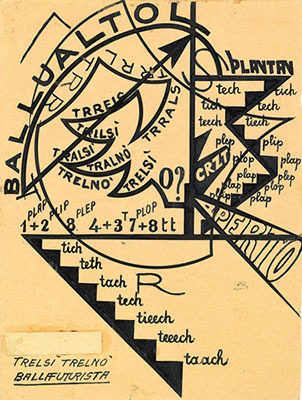 While mechanized figures and forms had appeared earlier (in the art of Fortunato Depero, for example), Ivo Pannaggi and Vinicio Paladini articulated the principles of this idiom in their 1922 “Manifesto of Futurist Mechanical Art.” Enrico Prampolini also adopted a mechanical language at this time, and he subsequently expanded and signed the manifesto, publishing it in his journal Noi in 1923. 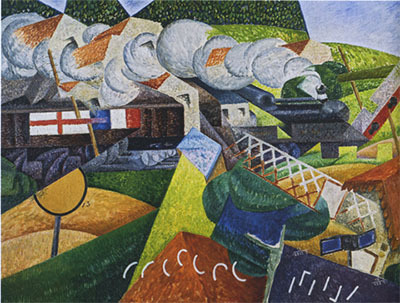 Pannaggi’s Speeding Train (1922) demonstrates the Futurists’ sustained interest in the locomotive as a symbol of modernity, motion, and the machine. 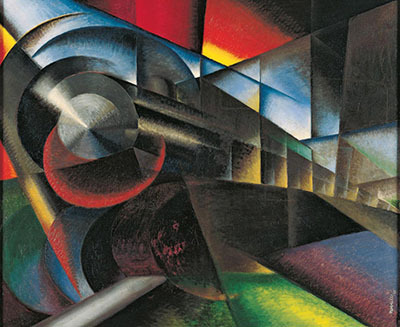 The painting depicts a powerful train barreling toward the viewer at a diagonal angle. 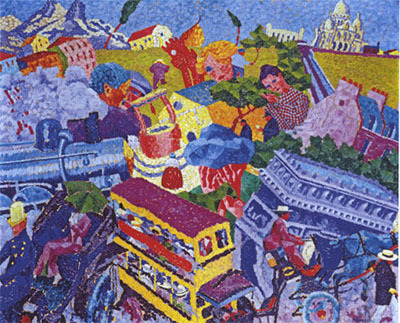 Speeding Train suggests the total sensory experience of observing the daily trains passing through the small coastal towns along the Adriatic (the blur of the moving cars, the clamorous noise of the motor, the ear-splitting scream of the whistle). 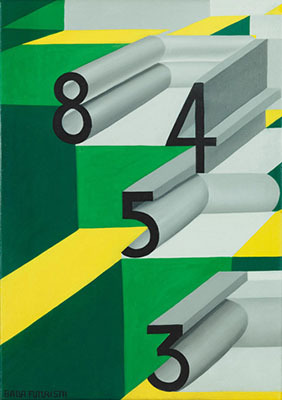 Later, Pannaggi’s interest in machine aesthetics led him to integrate Constructivist elements such as beams, cubes, cylinders, and three-dimensional letters into his work. 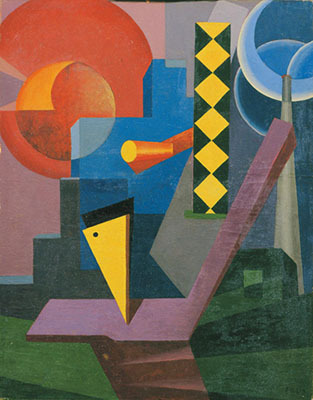 In 1932–33 he attended the Bauhaus in Germany, the only Futurist aside from Nicolaj Diulgheroff to do so. 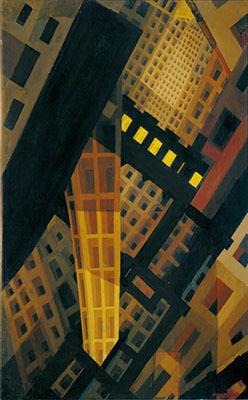 The Futurists celebrated the modern city. 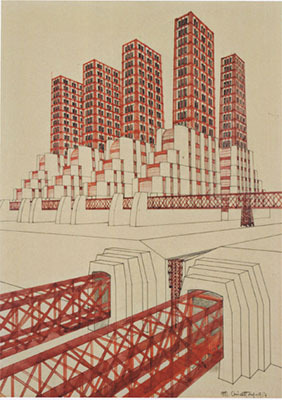 Rejecting historicism and seeking to revolutionize urban life, architects Mario Chiattone and Antonio Sant’Elia proposed utopian visions for cities of the future in two series of drawings: Buildings for a Modern Metropolis and CittÃ Nuova (both 1914). Embracing new materials and industrial methods that would alleviate the need for internal load-bearing systems, these designs feature soaring, narrow structures outfitted with thin, lightweight facades. External elevators and viaducts shoot up the spare, windowless planes. 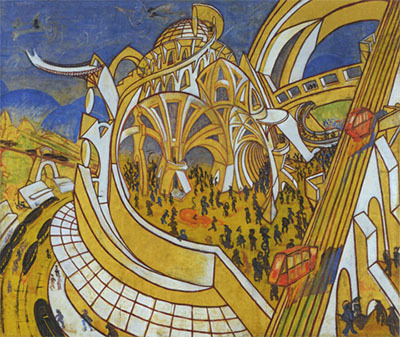 The Futurist emphasis on speed is accommodated by unimpeded transportation systems, including facilities for both air and rail travel (see Sant’Elia’s Station for Trains and Airplanes and Tullio Crali’s later plan for a similar center). 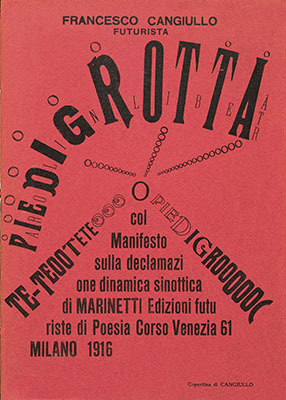 While Chiattone never defined himself as a Futurist, Sant’Elia outlined the goals of this style in a text that was subsequently edited by Marinetti and issued as “Futurist Architecture: Manifesto” (1914). These early forays into architecture stressed rhetoric rather than execution and pictorial imaginings took precedence over the specifics of implementation. 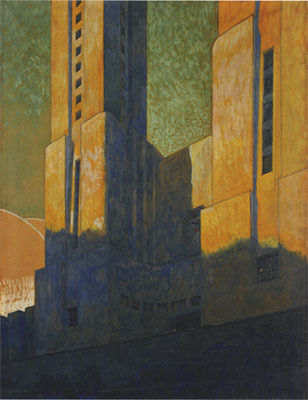 Sant’Elia died in World War I in 1916 and Chiattone moved in another direction, and their Futurist designs were never built. By the 1930s, the Fascist state was erecting new public buildings in the clean, spare parlance of Rationalism or the Stile Littorio (which references classical Roman architecture). Neither the complex modern metropolis envisioned by architects such as Chiattone and Sant’Elia nor the theatrical urban buildings dreamed up by Virgilio Marchi were realized. 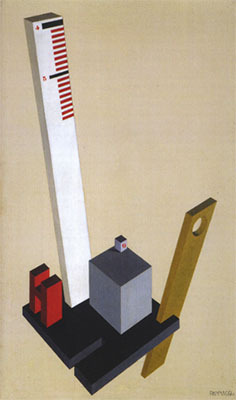 Their successor, Alberto Sartoris (a dedicated Fascist), also built few of his designs, and he vacillated between Futurism and Rationalism, exhibiting the same plans under both banners. 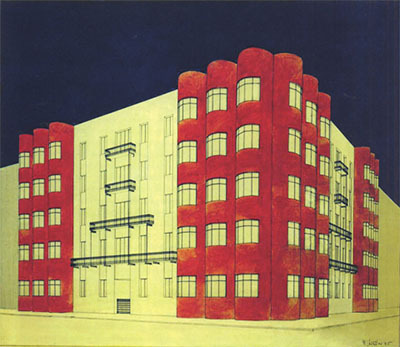 While he aligned himself with Futurism conceptually, he leaned toward functionalist aesthetics. Sartoris’s axonometric projections eschew superfluous forms in favor of structures that alternate massed volumes with empty space. 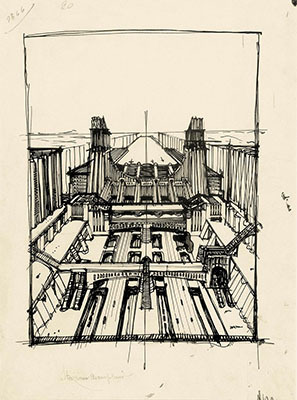 Crali, better known as a visual artist, also imagined modern envelopes for practical structures, as in his multipurpose Sea Air Rail Terminal. 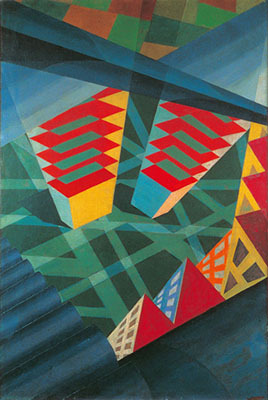 Among the few Futurist structures to be built were temporary ones for fairs, such as those conceived by the multifaceted artist Enrico Prampolini. 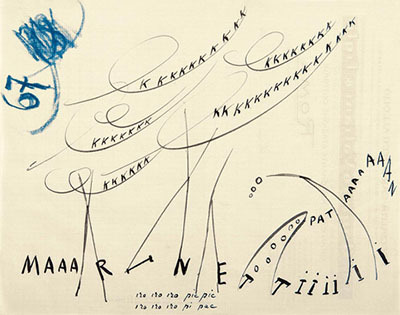 In one of their pivotal inventions, the Futurists conceived a style of free-form, visual poetry called parole in libertÃ , or “words-in-freedom.” Following F. T. Marinetti’s example, the Futurists liberated words and letters from conventional presentation by destroying syntax, using verbs in the infinitive, eliminating adjectives and adverbs, abolishing punctuation, inserting musical and mathematical symbols, and employing onomatopoeia. Words-in-freedom poems were read as literature, experienced as visual art, and performed as dramatic works. The Futurists published them in multiple formats and declaimed them at the Futurist serate (performative evenings). 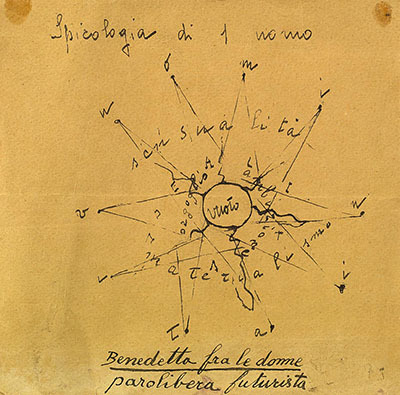 While Marinetti introduced the form, many Futurists contributed their own interpretations. 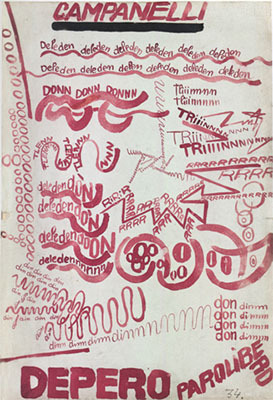 A group of pictorially, verbally, and aurally imaginative sketches for words-in-freedom (called tavole parolibere) originated in the revolutionary period of the 1910s. 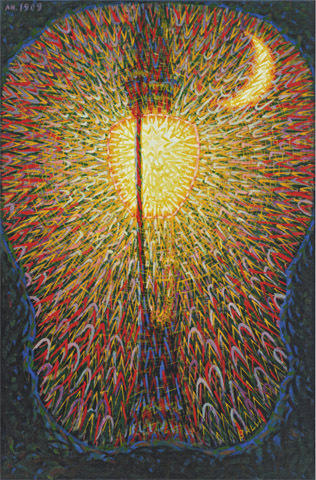 Giacomo Balla invented phonovisual constructions, while Fortunato Depero devised an abstract language of sounds he called onomalingua. 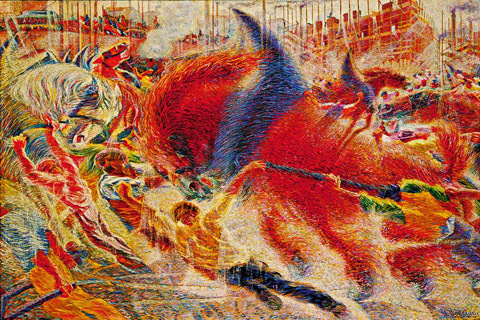 Francesco Cangiullo’s Large Crowd in the Piazza del Popolo (1914) engages the themes of the city, the crowd, and upheaval. 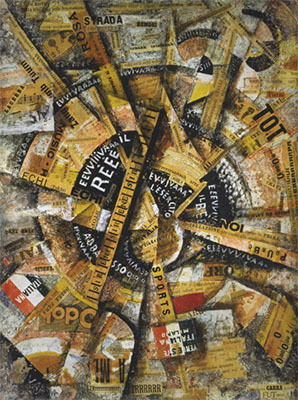 The circular structure of Carlo CarrÃ ’s Chronicle of a Milanese Night Owl (1914) captures the sensory whirlwind of voices, sounds, and figures he encountered during a nocturnal walk in Milan. 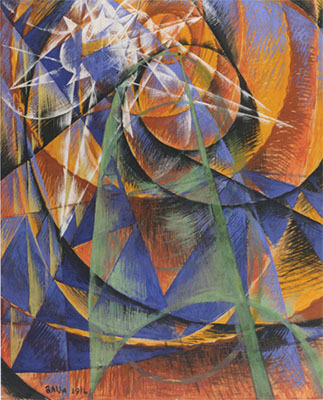 In 1915 Giacomo Balla and Fortunato Depero wrote the seminal manifesto “Futurist Reconstruction of the Universe.” Using characteristically aggressive language, they call for a reenvisioning of every aspect of the world, even demanding Futurist “toys.” These ideas fed the Futurist conception of the opera d’arte totale (total work of art), an ensemble that surrounds the viewer in a completely Futurist environment. Balla, Depero, and others soon put their ideas into practice, opening case d’arte (art houses) to market their decorative arts designs. Balla converted his home in Rome into a showroom of sorts, designing nearly everything in the residence. 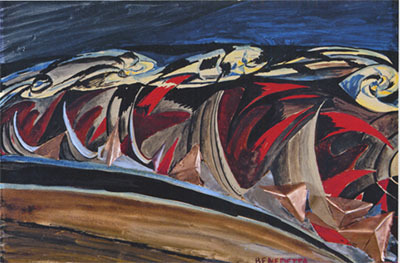 Depero established an artisanal studio in his native town of Rovereto. 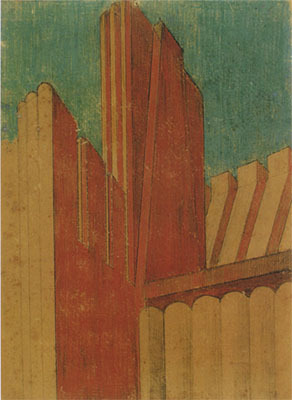 Balla made screens, which often shared concerns with his speed-related paintings, and other furniture. 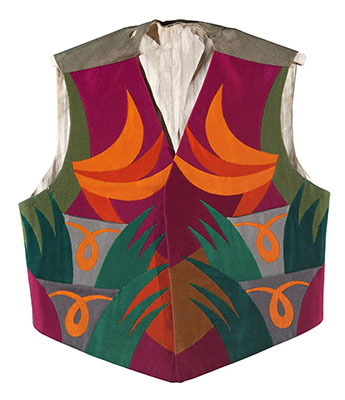 Both artists designed waistcoats that reflect the aesthetics of their paintings. 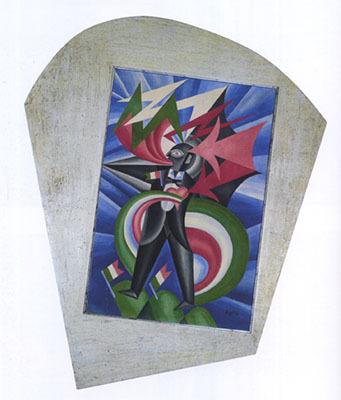 Depero fashioned his brightly colored vests expressly for the Futurists to wear with their bourgeois suits to signal their radicalism. 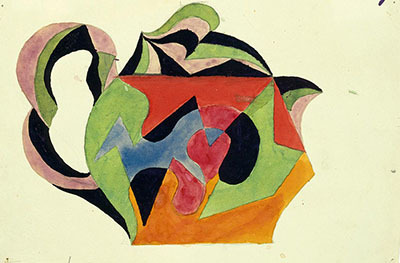 Balla conceived a coffee service (recalling his 1916 sketches for a tea set) that was produced in majolica in Faenza in 1928, and many other Futurists experimented with ceramics, especially in the 1930s. 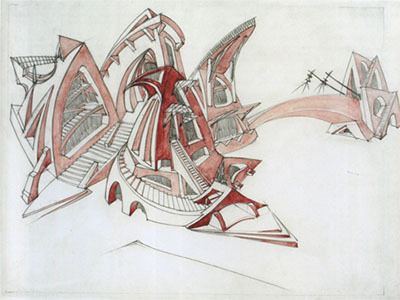 Some Futurist artists secured commissions to design elaborate interiors for homes, restaurants, and cabarets. 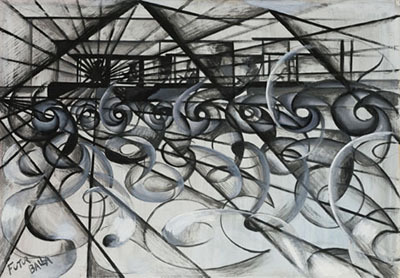 The swirling, sometimes abstracted, aerial imagery of Futurism’s final incarnation, aeropittura (painting inspired by flight), arrived by the 1930s. 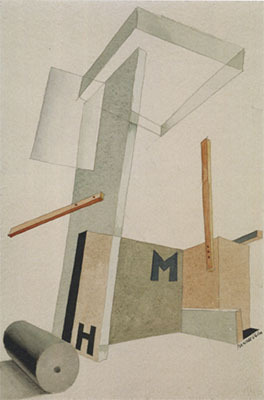 Aeropittura emerged from the Futurists’ interest in modern aircraft and photographic technologies. Propelled by Italy’s military pre-eminence in aviation, their fascination with the machine shifted focus from the automobile to the airplane. 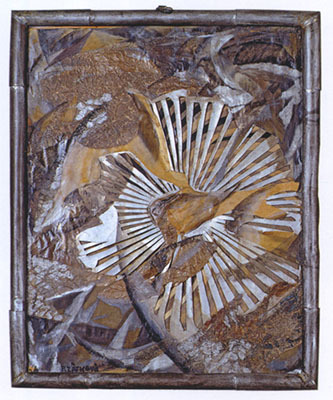 In flight, the artists found disorienting points of view and new iconographies to explore in painting, photography, and other mediums. 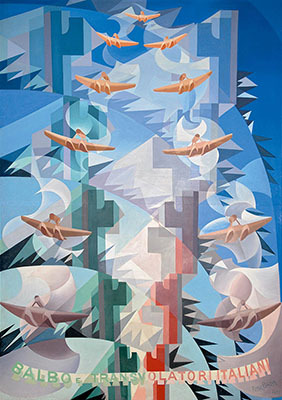 Evidenced by the work of Tullio Crali, Gerardo Dottori, and Tato, aeropittura represented a novel painting approach that allowed the Futurists to address nationalism, speed, technology, and war, providing radical perspectives that exalted these concepts. Benito Mussolini equated his Fascist regime with the Roman Empire at its peak; not coincidentally, many artworks from the 1930s incorporated imagery from Roman antiquity. 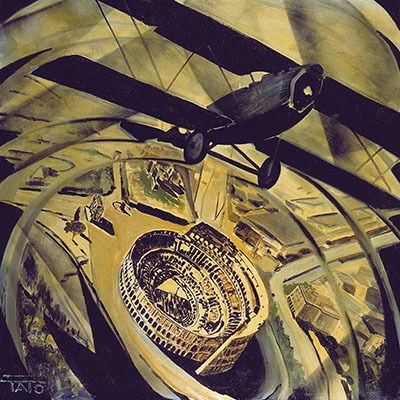 Tato’s Flying over the Coliseum in a Spiral (Spiraling) (1930) depicts an airplane soaring over an iconic Italian structure, the circles of the plane’s path echoing the ancient building’s form. 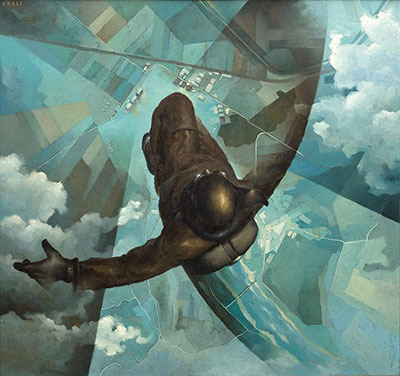 The Futurists’ engagement with the aerial quickly expanded beyond painting to other fields, including ceramics, dance, and experimental photography. 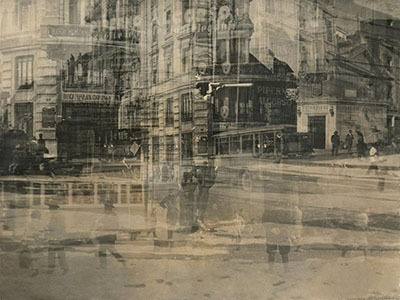 Inspired by Henri Bergsonâ€™s philosophical ideas on dynamic movement, in late 1911 the Futurist painters began to freely adapt the photographic motion studies of French biophysicist Etienne-Jules Marey and Anglo-American photographer Eadweard Muybridge. 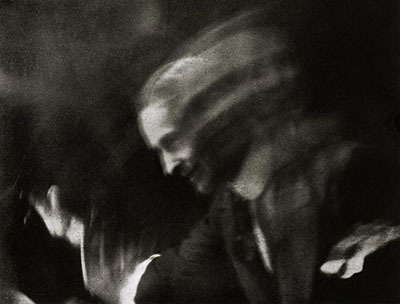 Seeking to revitalize painting, Futurist Anton Giulio Bragaglia worked with his brother Arturo Bragaglia, an accomplished photographer, to develop a method of capturing movement they called photodynamism. 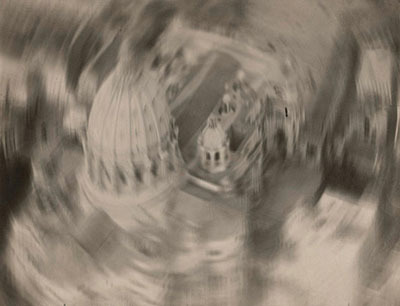 The pictures on which the Bragaglia brothers collaborated plot the movement of a figure, usually from right to left, with intermediary sections of motion blurred. 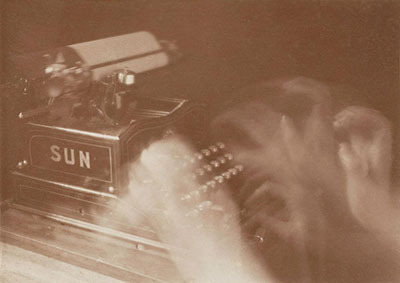 Despite their proclaimed interest in new technologies, the Futurists largely neglected photography after these early experiments until the 1930s. 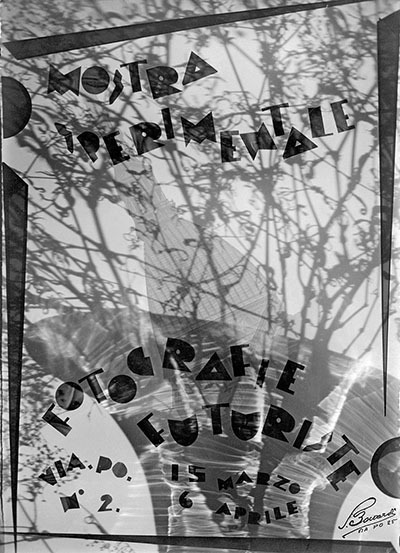 In the 1930 â€œFuturist Photography: Manifesto,â€� F. T. Marinetti and Tato declared photography to be a powerful tool in the Futurist effort to eliminate barriers between art and life. With the camera, they could explore both â€œpureâ€� art and artâ€™s social function. 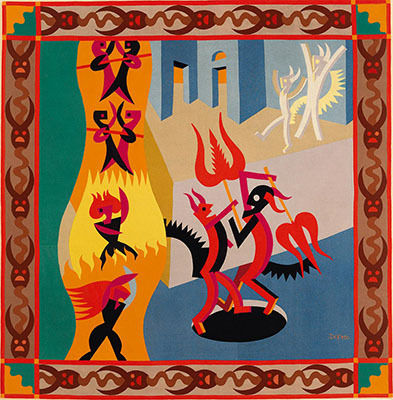 Also a designer, graphic artist, and painter, Tato was a leader in Futurist photography and used the camera for diametrically opposed goals; his works express his ideological support of the Fascist regime and reflect his engagement with the absurd. 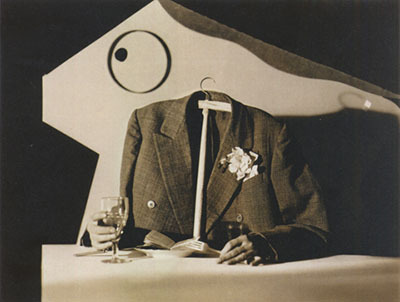 Futurist photography exhibitions of the 1930s presented avant-garde images that not only reveal an awareness of international modernist currents but also demonstrate strategies specific to the Italians. Futurist photographic techniques include the layering of multiple negatives, perspectival foreshortening, and photomontage. 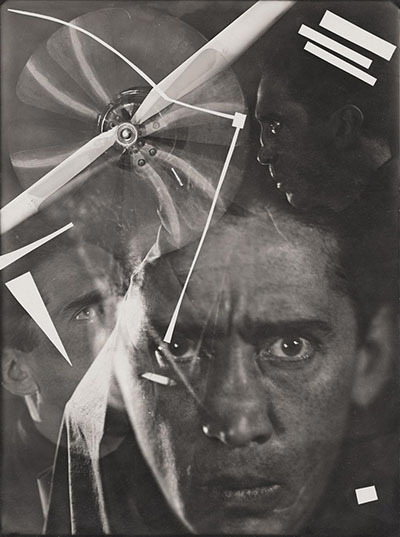 While the 1930s exhibitions included photographs by Bragaglia, the manifesto suggested that the newer photographersâ€™ superimpositions achieved a simultaneous representation of time and space that moved beyond Bragagliaâ€™s photodynamism. 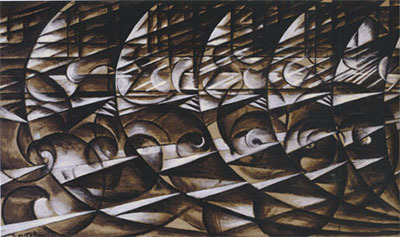 The 1930s also saw the merging of photographic technology with other Futurist art forms, especially dance, painting, and performance inspired by mechanized flight. Meanwhile, photographers Filippo Masoero and Barbara developed novel conceptions of space by photographing Italian cities from an airplaneâ€™s cockpit. 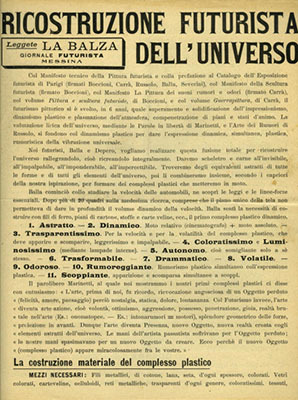 Piero Boccardi, Cover of catalogue for Experimental Exhibition of Futurist Photography, 1931.